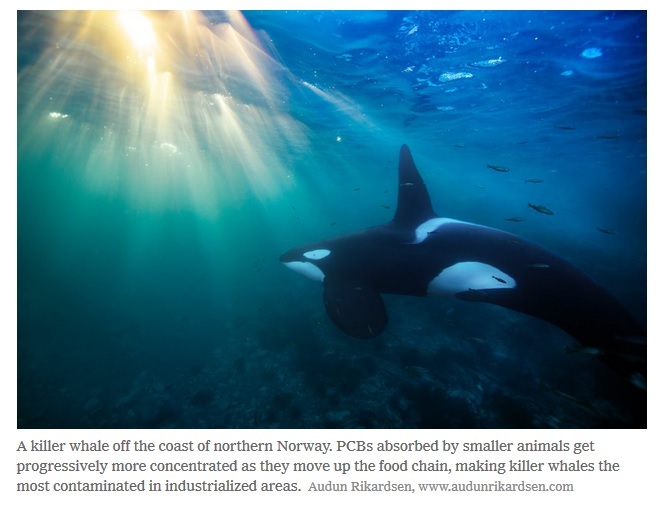 A new study based on modeling shows that though banned in 1979, PCB industrial chemicals (polychlorinated biphenyls) are lingering in the blubber of killer whales — and they may end up wiping out half the world’s population of killer whales in coming decades. Concentrations of the toxins are very high, lingering in the orcas’ blubber, and are passed from mother to calf. The most at-risk killer whales are those that eat seals and other animals that are themselves fairly high on the food chain and quite contaminated by these chemicals…Killer whale populations in Alaska, Norway, Antarctica and the Arctic among other places, where chemical levels are lower, will probably continue to grow and thrive, the study found. But animals living in more industrialized areas, off the coasts of the United Kingdom, Brazil, Hawaii and Japan, and in the Strait of Gibraltar are at high risk of population collapse from just the PCBs alone — not counting other threats. PCBs remain the highest chemical contaminant in the whales’ blubber, and are known to disrupt the whales’ reproductive, endocrine, thyroid and immune systems, harm their brains and trigger cancer. Researchers say they hope that policy makers would do more to help protect them, with the study helping to persuade them as well as the substantial appeal orcas have with the public.